Tumbled Travertine tiles are a lovely natural stone for heavily trafficked floors. They have an individual appearance that suite many installations. This Travertine Cleaning Hemel Hempstead project arose because the Tumbled Travertine floors were soiled and dull. The soil came from three large dogs bringing in oily dirt and grit from the large garden surrounding the property. The floor had been “professionally” cleaned a few years ago, but the homeowner was disappointed with the results. The contractor could not achieve the same levels of cleanliness as the sample clean. Their excuse was that they did the sample clean by hand and the homeowner could not expect them to clean the whole floor by hand! The poor cleaning made the homeowner very wary of hiring another cleaning company. The homeowner was also advised to use a strong, degreasing cleaner to clean her floor. 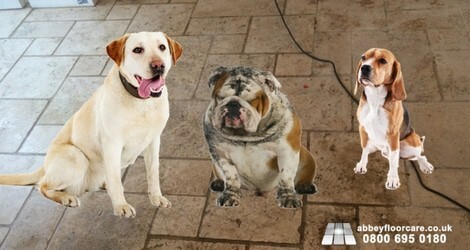 This kind of cleaning chemical is totally inappropriate for maintaining a natural stone floor. Overuse of this cleaning chemical degrades any protection applied to the floor and spreads greasy soils over the stone rather than removing them. Gradually the floor was getting more difficult to clean. 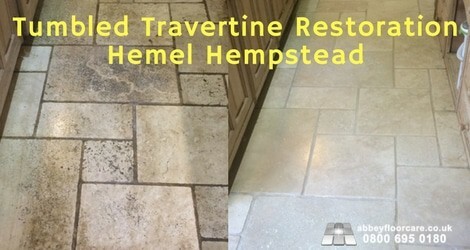 So the homeowner searched online for travertine cleaning Hemel Hempstead and came across our website. She was particularly impressed by the cleaning results we achieved on other Tumbled Travertine cleaning projects. 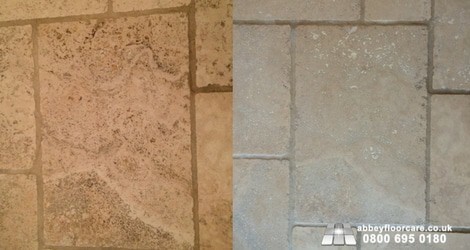 After some discussions, we were hired to clean, grout fill and seal the Tumbled travertine tiles in her home. The natural holes and voids in the tiles had soils mixed with natural oils from the dog’s coats and old cleaning solution. This mixture made the dirt very difficult to remove with domestic cleaning equipment. We started by agitating the ingrained surface soils with rotary cleaning equipment and travertine cleaning compounds. The cleaning compounds include cleaning chemicals to help emulsify the oily soils. Rotary cleaning is excellent for ingrained surface soils, but it will not remove impacted soils in the holes. We used our pressurised water “clean and capture” tools to spray pressurised water into the holes. The pressurised spray helped to lift most of the soils out of the holes. We filled the holes in each tile with our Travertine grout filler. 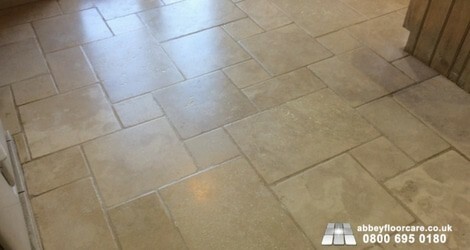 Grout and raw travertine can be porous, so we first sealed the floor with a high quality impregnating sealer. Then we applied four coats of mid-sheen surface sealer to give the floor a tough sealed finish. A surface sealer also protects the finish against abrasion from foot traffic. Also, the Travertine Cleaner we recommended contains a small amount of finish sealer, helping maintain the finish every time the floor is damp mopped. When an area shows signs of wear, it can be topped up again with a new coat of sealer. Our client was delighted with the final appearance. She had no idea that her floor would ever look so good again. We gave detailed cleaning instructions and left a container of Travertine cleaner. We also explained the importance of daily cleaning to help remove dry soil and maintain the finish on the floor. If you would like your dull, soiled Travertine floor looking like new again, CLICK HERE for your free, no-obligation Travertine restoration quotation.